Does watching ice melt help us talk about the climate emergency? A critical view on artists’ commitment at the end of COP24. I have long been sceptical about the tactic of shipping celebrity artists, musicians and writers to the Arctic to watch ice floes break off as a spectacular means of dramatising climate change. This has been mainly exemplified by the expeditions of Cape Farewell between 2003 and 2010 (neatly parodied by one of the celebrities himself, Ian McEwan in Solar) but also reached its most ludicrous extreme, promoted by Greenpeace, of all people, when they shipped the Italian pianist Ludovico Einaudi to the Arctic in 2015 along with his grand piano to play Elegy To The Arctic on a floating ice floe. It seems similar to the tactics of drinks companies who advertise their vodka and gin as containing fresh water harvested from the ice of the Arctic. 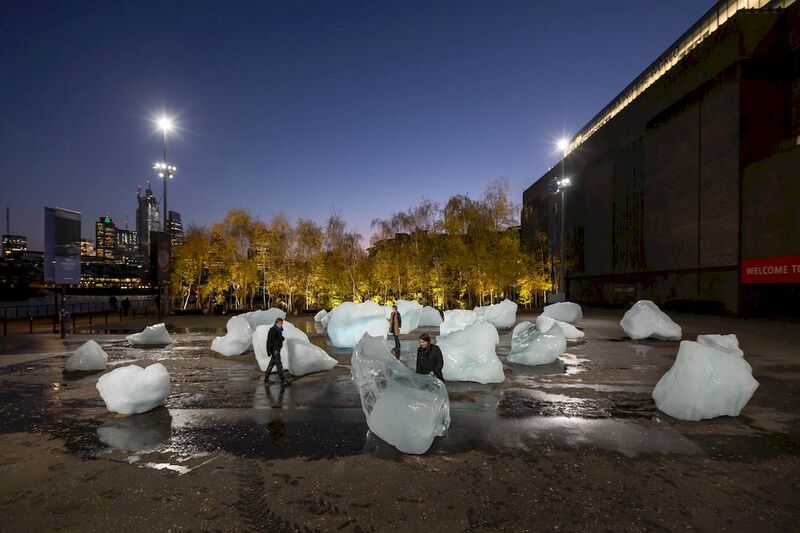 The end of COP24 in Katowice, Poland, already overshadowed by the new climate emergency outlined by the IPCC 1.5 degree report, saw the spectacular Ice Watch initiative by artist Olafur Eliasson and geologist Minik Rosing, who have shipped lumps of melting ice to Katowice and London, where they are still publicly melting. How can the artist justify the carbon impact of this action? The company producing the work, arts and sustainability organisation Julie’s Bicycle, in London, were also asked at a recent press conference about the carbon footprint of Ice Watch. They say on their blog that they will publish the exact calculations of the carbon footprint on their website at the end of the project. I asked one delegate who had already left COP24, Stuart Capstick, of the Tyndall Centre for Climate Research and the Climate Communication Project – who went and came all the way back by train – as some climate scientists now insist on doing, how it went. “There was a pretty sombre atmosphere – though of course most of the negotiations happen behind closed doors”. He pointed out some bizarre anomalies, such as the stand from Katowice, selling souvenirs and jewellery made of coal. What did he think of gestures like those of Eliasson’s melting ice? “If the interpretation of this is just increasing the sense of doom, there is a risk that such art only really draws attention to dystopias”. However, he generally agrees with the approach of the new activist movement Extinction Rebellion. “They are upfront about the scale and magnitude of the climate emergency and bring raw power and bluntness to the situation. There are some things I disagree with in their rhetoric but generally I am with them”. Increasingly well-known artists are also becoming involved with Extinction Rebellion. 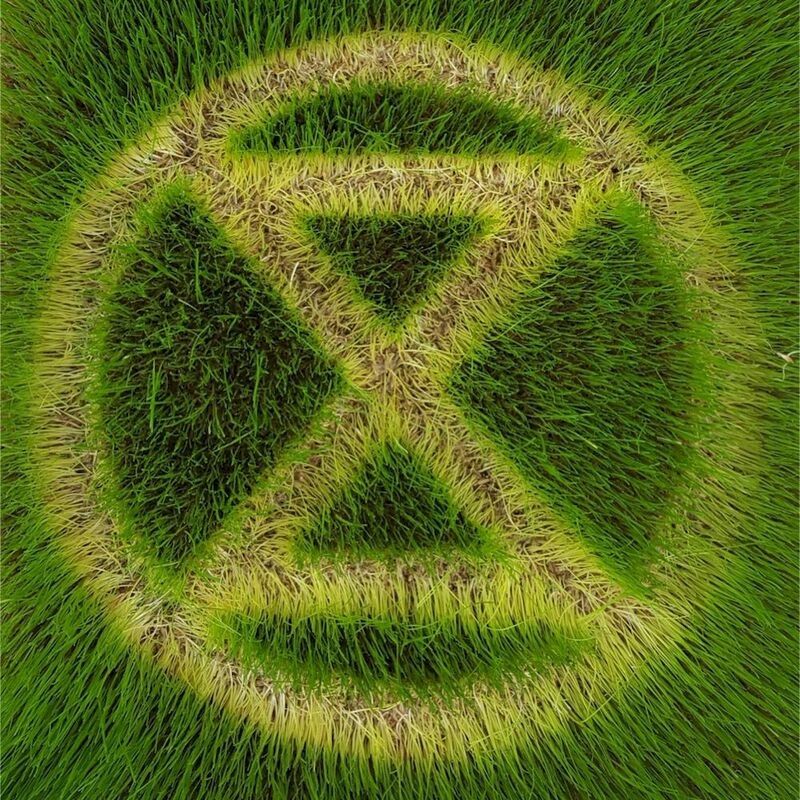 Gavin Turk, one of the original ‘80’s YBA’s (Young British Artists) was arrested at the recent blockade of the bridges in London and the internationally known duo Heather Ackroyd and Dan Harvey have made one of their distinctive grass sculptures in the shape of the Extinction Rebellion symbol. Artists are expected to be present again at the Rebellion’s next high-profile action ‘Reclaim the BBC’ at Broadcasting House, “For too long the BBC has either ignored or downplayed the climate emergency – Let’s reclaim OUR BBC to tell the truth on climate change” (from the event publicity). Extinction Rebellion by Ackroyd & Harvey. The action coincides with the Winter Solstice and another organisation is suggesting we celebrate ‘Climatemas’ instead of Christmas. The organiser, Bridget McKenzie told me “Climatemas is part of the plan for Climate Museum UK, which is a mobile, experimental and digital museum to creatively stimulate a response to the climate emergency (and linked threats to the biosphere). The core of the project is a pop-up museum – a collection of loose parts…It encourages people anywhere (experiencing the winter solstice i.e. the Northern Hemisphere) to be creative in raising awareness of climate change, to gather with costumes, art and spectacle, and to share their activities. Lucy Neal, artist and activist with Encounters Arts – creators of Walking Forest – has also arrived back on the long train journey from COP24, after carrying there – with Shelley Castle – the seed of a very special tree. She told me: “A COP is an intense, intricate, massively complex human affair. Over 20,000 people gather to change the narrative dominating every waking, sleeping moment of all life on Earth: humans have overreached themselves and are responsible en masse for bringing about the 6th Mass Extinction, global warming and an array of social and ecological injustices to boot. We travelled by train for 2 and a half days there and back for a singular, simple purpose: to gift to the remarkable people we would meet there the seed of a tree planted by a Suffragette Rose Lamartine Yates over 100 years ago from the Suffragette Arboretum at Batheaston”. Perhaps small gestures like this are in the end more powerful than spectacular blocks of melting ice. Meanwhile, behind the closed doors of COP24, there was an inconclusive ending, bearing in mind the continuing signs of the climate emergency, the extreme weather and wildfires of the past year, and the starkest warnings yet from scientists about the need to move towards zero emissions, not just the 2 per cent agreed in Paris. It may now take drastic measures to get governments and industries to listen.